The Carpenter's Ministry Toolbox: EDUCATION: Game Show Buzzers! One of the most challenging parts of playing games with groups of kids is determining who raises their hand first when answering questions during the game. 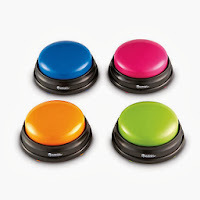 The answer to that is in using game show buzzers and I've found some that are very fun. Try using them for confirmation, Sunday School, or youth activities! Lights and Sounds: Laser, Buzz, Charge!, and Siren at Trainer's Warehouse - (4 for about $25) These also light up! You can also get them all at Amazon.com for about the same prices.